How Soon Can Refuges Recover from Sandy? A student at Berkeley replicated bird surveys that were done a century ago and turned up similar numbers of species. Injuries to swans' hips may be more common than thought and probably result from landing on hard surfaces. A dead carrier pigeon from World War I was found in a British chimney. It had a coded message attached to one leg, which has proven resistant to interpretation. A rat eradication program is continuing on South Georgia Island to rid the island of invasive rats that threaten the island's breeding birds. The American Bird Conservancy wants Congress to ban five species of constrictor snakes from importation. The release of constrictor snakes in Florida is having significant effects on its native wildlife. The Manumea still exists in Samoa but faces threats from habitat destruction and hunting. Sea levels are rising 60% faster than the IPCC predicted. Along with temperature data, this suggests that climate change is likely to be worse than the consensus forecasts. Here are some interactive maps showing what portions of major metropolitan areas could flood under several sea level forecasts. Meanwhile, Arctic sea ice melted over an area larger than the continental United States in 2012 and set a record 20% lower than the previous record. A newly-approved natural gas pipeline will go through the New York portion of Gateway National Recreation Area, particularly Jacob Riis Park and Floyd Bennett Field. Eastern wolves (formely Canis lupus lycaon) are now considered a separate species from gray wolves. Also in wolf news, hunting caused the deaths of seven tagged research wolves from Yellowstone. The deaths of those wolves pose a significant setback for the research program. New fossil footprints suggest that the giant extinct Diatryma was a herbivore rather than a carnivore. The footprints lacked any sign of the large talons that are typical of predatory birds. Several studies have shown that birds change their songs in response to the ambient noise in urban areas. In many cases, the birds adjust their pitch upward. A recent study found that Vermilion Flycatchers in urban areas sing longer songs than their rural counterparts. Among wild Orange-fronted Conures, each individual has their own contact call. Each bird responds more readily when other birds mimic their individual contact calls, so such mimicry can serve as a conversation starter. Emperor Penguins rest on sea ice during foraging trips at sea. Early bird ancestors most likely had trouble with powered flight, but their wings were useful for gliding from tree to tree. Sibley Guides: Can you find the Cackling Goose? Worldwide greenhouse gas emissions hit a record high in 2011. Anyone 27 or younger has never experienced a colder-than-average month. Here are some things that Obama can do about climate change even without Congress's cooperation. Marco Rubio indulges in some anti-science pandering on the subject of the age of the Earth. His pander is in line with recent conservative trends, which include installing climate change denialists on the House Committee on Space, Science, and Technology. A USDA Wildlife Services employee posted a series of photos to Facebook depicting wildlife cruelty. The incident has led to renewed calls for reforming the federal agency. Conservationists have rebuilt the population of Snake River Sockeye to 2500 fish in 20 years through a captive breeding project. Norway wants to cull its wolf population further, even though it has at most a few dozen wolves. The wreckage at Forsythe and other Northeast coastal refuges was yet another testament to the destructive power of Sandy, the superstorm that ripped up the New Jersey shore and flooded Manhattan. 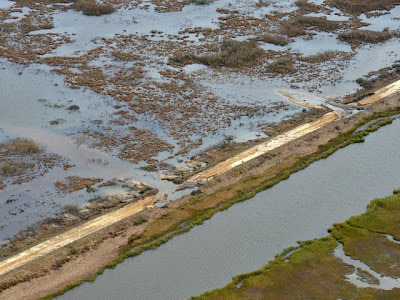 And it drew attention to the costly plans being considered by the federal agency to protect wildlife refuges from the impact of climate change and sea-level rise. 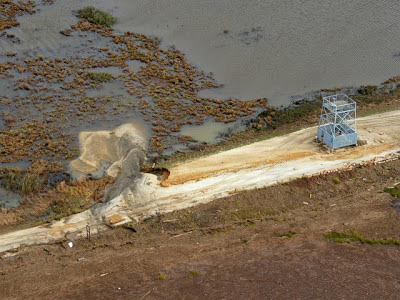 Sandy’s winds rammed a dirt and gravel dike at Forsythe with seawater, causing it to burst. Bay salt water rushed into a shallow freshwater pond created for birds such as the American black duck and Atlantic brant. The usual foot of water in which the birds dip their heads got saltier, rose to five feet and washed out vegetation, so the birds could no longer reach underwater seeds or pick bugs from leaves. Dozens of refuges between Maine and Virginia were pummeled. Four were damaged severely, including Forsythe, where about 130 boats in the Atlantic City area were blown into marshes, Kahan said. 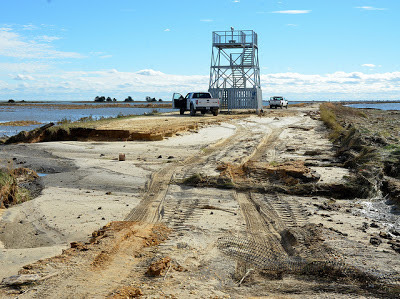 At Chincoteague National Wildlife Refuge in Virginia, part of the public beach and two parking lots were washed away on Assateague Island. 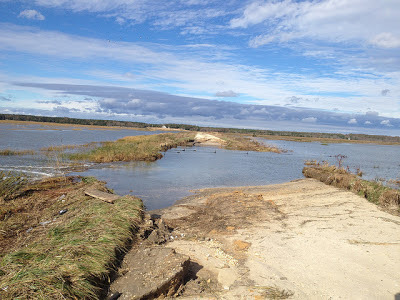 At Prime Hook National Wildlife Refuge in Delaware, a 1,500-foot breach in a dune sent salt water from the Delaware Bay into a freshwater pond where waterfowl eat, nest and give birth, and flooded homes on an island near the refuge. And at the Long Island National Wildlife Refuge Complex in New York, fallen trees blocked the entrance. Sandy created sea surge powerful enough to reshape portions of the coasts of North Carolina, Delaware and Maryland, and Virginia’s portion of the Delmarva Peninsula, which includes Chincoteague, said the U.S. Geological Survey. Thirty-five of the region’s 72 refuges were closed after the storm. Six million people per year — many from the District, Virginia and Maryland — visit the refuges, which cover 535,000 acres, and managers acted to protect visitors from “widow-makers,” damaged trees that crash down after storms, a Fish and Wildlife spokeswoman said. Forsythe still has not reopened. In addition to the busted dike and ruined pond, the wrecked boats appear to be leaking fuel, Kahan said. 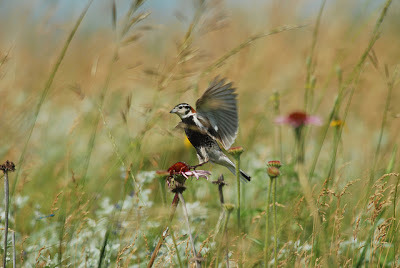 White-throated Sparrows (Zonotrichia albicollis) breed in northern forests and migrate south to the eastern and southern United States during the fall. In New Jersey, they stay through the winter, often in large flocks. I usually hear White-throated Sparrows before I see them. They call constantly to each other and kick up leaves with their feet to uncover food. Even though they are so noisy, it can be hard to see them under shrubs and thick tangles of branches. I took all of these photos in my backyard over the past few days. There have been at least six, maybe more, hanging around. The challenge with photographing them is to catch them when they hop onto an exposed perch where they might only sit for a few second before going back down into the fallen leaves. A census of Island Scrub Jays on Santa Cruz Island in California documented fewer of these endemic jays than expected. With only 2,500 individuals, this is one of the rarest bird species in the U.S.
A survey estimated that 22 million birds die from window strikes in Canada each year. The number is likely higher than that in the United States, which is more densely populated. For more about human-caused bird mortality, see this fact sheet (pdf) from the US Fish and Wildlife Service. David Sibley puts the same numbers into graphical form. Thousands of Lesser Flamingos have arrived at Tanzania's Lake Natron for their breeding season, which may be the largest breeding event since 2007. The habitat around Lake Natron is currently threatened by low water levels due to drought and proposed industrial development. The NY Times took a look at how hurricanes affect birds. Whooping Cranes are returning to Aransas NWR in eastern Texas to spend the winter. Meanwhile, there are lingering legal issues left over from the deaths of 23 cranes last winter. Environmental groups want the state to create a water management plan for the Guadelupe River that will provide adequate water for the refuge. A project is photographically documenting all 39 species of birds-of-paradise in their natural habitats. There are a few videos of bird-of-paradise courtship dances embedded in the article, and you can watch more here. A recent study found that New Caledonian Crows are able to infer hidden causes. The National Post has an article on Canada's quest to collect and retire all of its $1,000 bills, which are mostly in the hands of criminal enterprises. The main reason I am linking that article is that the Canadian $1,000 bill has a lovely image of Pine Grosbeaks on it. A bee-eater found in Scotland is very rare for that area. Bohemian Waxwings are also irrupting into the UK this winter. Also in the UK, a new wetland reserve opened in the Trent Valley. The Birdist: The First American Birder? Extinction Countdown: Controversial Toronto Zoo Penguins Not Gay after All? BP and the Department of Justice have reached a legal settlement on criminal charges arising from the Deepwater Horizon disaster in 2010. BP will pay $4.5 billion in fines for negligent operation of the drilling rig, lying about the volume of oil gushing from the well, and killing migratory birds. In addition, some managers face charges for the crew member deaths, and BP is still liable for Clean Water Act violations and various other civil claims. Speaking of oil spills, over 378,000 gallons of diesel fuel spilled into the Arthur Kill as a result of Hurricane Sandy, about a quarter of which has been contained. Nine oiled birds have been found so far. A study of computer models for climate change found that the models with the best track record so far predict more extreme warming than other models. That suggests that climate change may actually be worse than expected. LiveScience lists five ways that climate change is affecting the Arctic. Because of the lack of sea ice in recent Arctic summers, walruses are spending more time in coastal areas instead of out on the sea ice, their normal habitat. Bats are highly vulnerable to climate change, at every phase of their life cycles. This month the government of Ecuador is dropping 22 tons of poisoned bait on the Galápagos Islands to eradicate invasive rats. Hawks and iguanas that might be vulnerable to the poison have been relocated for the time being. More alternatives to incandescent light bulbs are becoming available. A recent study found that bonobos catch yawns from other members of their social circle. Contagious yawning is a behavior documented only among some social animals, including some birds. I yawned while reading that article. Hikers and hunters are changing wildlife along the Appalachian Trail. In particular, black bears and bobcats are negatively affected, while raccoons and red foxes have benefited. Wolf hunts have spread to the Midwest, and 196 wolves have been killed in the past month in Minnesota and Wisconsin. The short and long-term effects of Hurricane Sandy on bird populations are still being tallied. Some rare birds showed up in Philadelphia on the morning after the storm passed. Jennifer Hanson has been tracking the Post-Sandy status of birding sites in New Jersey over at Today in NJ Birding History. Tanzania is still considering building a soda ash plant at Lake Natron, the world's most important breeding site for Lesser Flamingos. A recent report suggests that Tanzania would gain more economically from promoting ecotourism at the site than from soda ash. French scientists have found two previously unknown colonies of Emperor Penguins that together account for about 6,000 chicks near Mertz Glacier in Antarctica. Wildlife officials in Oregon are concerned that cormorants nesting at the mouth of the Columbia River are eating too many of the endangered fish that spawn in the river. The linked article tries to compare how predation by cormorants compares to other threats to juvenile fish. A Goffin's Cockatoo in captivity has been recorded using tools to reach food, even though this species does not use tools in the wild. Analysis of Microraptor fossils suggests that it was a nimble flier. Birds can become intoxicated from eating fermented berries. Just as North America is undergoing a winter finch irruption, British birders are enjoying an impressive movement of woodland birds to backyard feeders. One rare bird that has appeared in the UK is a Little Bunting. City birds use different techniques to escape cats than their rural counterparts do to escape raptors. It is not clear if this is sufficient to neutralize losses to household and feral cat predation. President Obama's re-election this week means that his EPA will be able to proceed with regulations on greenhouse gas emissions if it chooses. However, what the administration will be able to accomplish on this front will be limited by Congressional opposition and the administration's embrace of an "all of the above" energy policy. 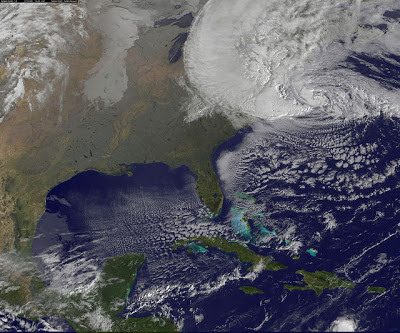 Hurricane Sandy has entered the climate change conversation; whether it will spur significant action remains to be seen. One thing that may result from Sandy is the erection of barriers to protect New York Harbor from storm surges. There are various proposals floating around; one is to ring Manhattan and Brooklyn with artificial wetlands that would serve as parks most of the time but absorb some of the energy of storm surges that enter the harbor. Floodgates are another option. Monsoon failures may become more common in India thanks to climate change. Deforestation can be detected from space via a NASA satellite. Recent data shows extensive deforestation in South American and West Africa. A 2001-2002 drought in the Rocky Mountains made the mountain pine beetle infestation much worse. An extremely rare whale, the spade-toothed beaked whale, was found beached in New Zealand. It was the first time the species was recorded as a complete specimen, and it was only identified by DNA testing. It looks unlikely that birders will be driving around the wildlife drive at Brigantine in the near future. Those cormorants are swimming through what used to by the road along the south dike. 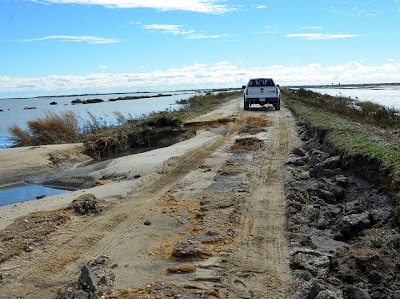 Other parts of the road are eroded as well. It looks like the refuge will be closed indefinitely, but the status will be updated on the Forsythe NWR website. All photos are courtesy of the US Fish and Wildlife Service. What happens to birds in a hurricane? Some birds' habitat is destroyed or reshaped. Others try to hunker down in sheltered areas or get swept up in the storm's winds and carried to far-off locations. 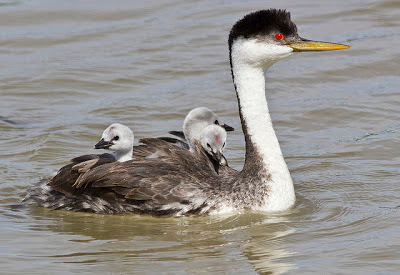 (via Nick) The ABA Blog reports on unusual bird sightings in Sandy's wake (part 1; part 2; part 3). Despite record flooding, the Wild Turkey at Battery Park survived the storm. Seabirds are among the most threatened birds. Conserving them requires a variety of strategies, from clearing islands of invasive predators to improving fishing techniques to make them less deadly to birds. 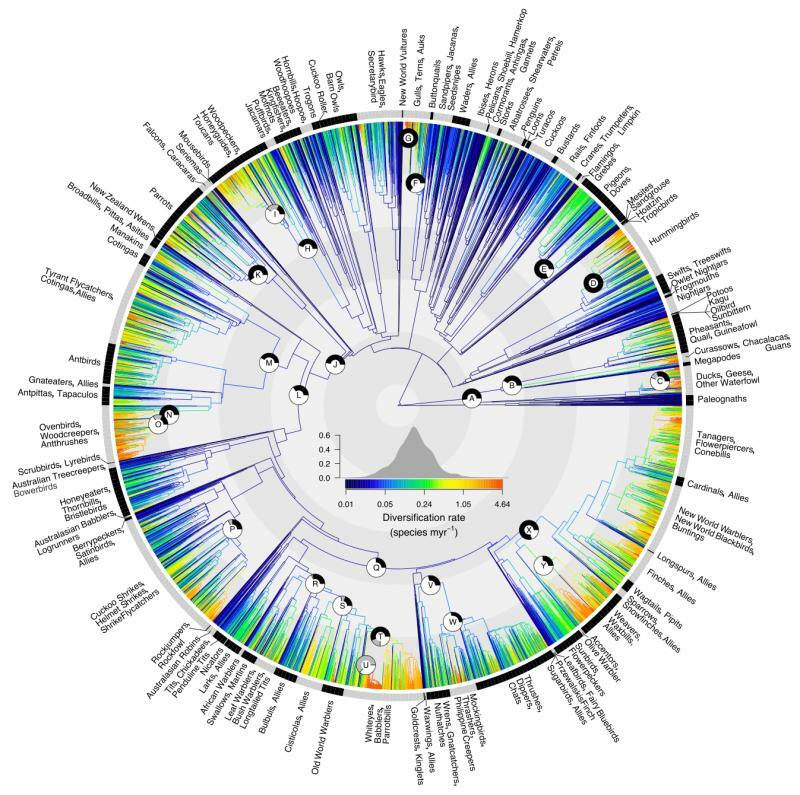 A new study maps the evolutionary position of almost all of the world's 10,000 bird species based on their genetics. Much remains to be discovered about the critically endangered Northern Bald Ibis, and basic details of its life history have only recently come to light. Five British ornithologists met while being held in a German PoW camp during World War II and later went on to lead conservation efforts. The Birdist: Can you ID Selasphorus hummingbirds by call note? Hurricane Sandy dominated the news for the past week as it made its way from the Caribbean to Canada via New Jersey and killed dozens of people and set numerous weather records in the process. The obvious questions (from an environmental perspective) are how much climate change influenced the storm and whether a warmer climate will mean more storms like this in the future. Here is a roundup of articles on that subject. In light of climate change, does it make sense to rebuild the shore as it was, or should more allowance be made for rising sea levels? The storm stirred up all sorts of contaminants. The last dam on the Elwha River is slowly draining as part of the Elwha restoration project. The goal is to restore the river to its natural, undammed state. Despite an active conservation program, axolotls have struggled to survive in the wild. Hurricane Sandy made landfall in New Jersey around 8 pm on October 29. Up until that point, things had been going as well as could be expected, with a lot of rain and wind, but not much damage. Around the time Sandy made landfall, trouble started with the electricity. First the lights started flickering, and then there were two or three momentary power drops — the lights would go off, my desk fan (to cool my laptop) would stop, and I'd lose my internet connection. Each time, the power was restored after about a minute. Then around 8:30 pm, the power went off for good. It was off until about 6 pm last night. A lot of nearby towns are still without power. The good news is that I survived the storm with no injuries. So did my parents and sisters and everyone else I know that I've been able to contact so far. My house is still intact, and the water never got cut off. It also isn't 90°F, so life without electricity was a lot more bearable. I am so glad that the stove and hot water heater are both powered by natural gas and not electricity. There was surprisingly little flooding for a storm of this magnitude, at least in Central New Jersey. Low-lying areas were wet, and a few roads were flooded, but the main roads seemed to be open. The flooding was nothing like that during Irene and Floyd. While there was little flooding, the wind was ferocious on October 29. It was the worst wind storm I can remember. Many trees and branches are down. I saw at least one car with a Silver Maple on top of it. Bradford Pears were massacred. One Gingko had its top ripped off and tossed on the ground beside it. Other trees took power lines with them, and some crashed through houses. Many trees in my birding patch were uprooted. The Norway Maples along the back fence of my yard lost a lot of limbs, including a big one that crushed the fence. I feel very lucky because this could easily have been a lot worse, and there are still a lot of people that have no power or water or even homes in some cases. I did a little bit of post-hurricane birding on Tuesday morning, once I had an idea of what the storm had caused. There was nothing rare at Donaldson Park, my one stop. The Chipping Sparrows I had seen on October 28 were still there, though reduced in number. There were hundreds of gulls, including 119 Laughing Gulls. These are almost certainly storm-blown birds since they rarely visit the site except during unusual weather patterns. 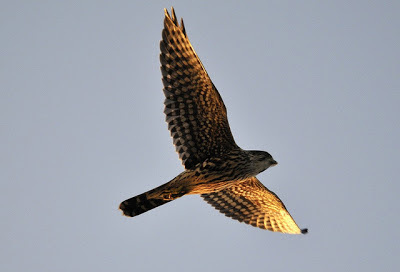 I also saw a Peregrine Falcon and a Northern Harrier. The latter might be a storm-displaced bird, though it is hard to be certain. I have only seen one other harrier at the site as far as I can remember, and that was several years ago. The Peregrine, of course, is a local breeder.